Defiance is an unincorporated community and census-designated place in Saint Charles County, Missouri, United States. The Daniel Boone Home, Daniel Boone Hays House, and Isaac McCormick House are listed on the National Register of Historic Places. The Wolf-Ruebeling House is formerly listed. The community was named in the late 1800s when the Katy Railroad arrived. Initially, the town was to be called Parsons, after the landowner. Because there was already a Parsons, Kansas on the Katy line, settlers considered other names, including Missouriton and Bluff City, before deciding on Defiance because of the hamlet's defiance of rival Matson to get a station on the line. From here west to Marthasville are numerous wineries; SH 94 is sometimes called the "Missouri Weinstrasse". The area is part of the Missouri Rhineland, where vineyards are cultivated on both sides of the Missouri River. Started originally by German immigrants, the wine industry also was shaped by later Italian immigrants. 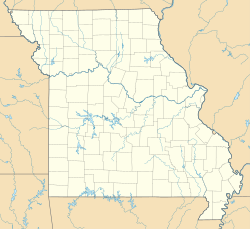 Defiance was used as the name for the new settlement on top of the ruins of Saint Louis, Missouri in the television series of the same name. The series was produced by Universal Cable Productions, in transmedia collaboration with Trion Worlds who have released an MMORPG video game of the same name that is tied into the series world and mythology (but did not take place in the titular city). ^ Munn, Patrick (February 21, 2012). "Exclusive: Details On Syfy's New Series Defiance". TVWise. Retrieved February 22, 2012. This page was last edited on 25 October 2018, at 00:12 (UTC).